Lake Mishnock Vol. Fire Company hasn't added a story. Our Fire Company is in dire need of updating our older outdated lifesaving equipment. We say WE need the equipment, when in reality the COMMUNITY needs us to have these tools, when seconds count. As of right now we have a Lifepak 12 which is being phased out by the Lifepak 15, making it obselete. For those that do not know, a Lifepak is a Heart Monitor/Defibrillator crucial in an EMTs battle to save lives; Especially when it involves critical Advanced Life Support interventions. Another item we need in despiration is a set of Jaw of Life. Being it is that we respond to 12+ miles of interstate 95 and surrounding communities Currently we have the first set of Jaws of Life in service in the State of Rhode Island. We need to upgrade to a high pressure, high strength, lighter and less combersome set of tools to effectively do our job. When accidents happen, we as EMTs have less than an hour from the time of the accident to the time we transfer patient care to the trauma center. We need this equipment which is essential in aiding the communtity in their time of need. The Lake Mishnock Vol. 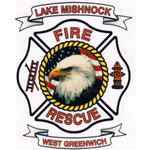 Fire Co.
Lake Mishnock Vol. Fire Company hasn't posted any updates yet. Lake Mishnock Vol. Fire Company is managing the funds for this campaign.